When Joe Wright’s Pan moves its setting away from London and into Neverland, Peter (Levi Miller), not yet the hero we know he becomes, steps out onto the deck of a flying pirate ship to observe a strip mine jammed with filthy children singing a shanty song that sounds an awful lot like “Smells Like Teen Spirit.” That’s because it is “Smells Like Teen Spirit,” belted out with a forced resignation by the captive kiddies at the behest of vicious, cruel, equally filthy pirates. Not long after, Peter stands on the precipice of actual doom, and the crowd rumbles the lyrics to “Blitzkrieg Bop,” no longer a ditty about German battle tactics in World War II but instead a death march for lost boys who haven’t been lost long enough to earn the name. No spoilers here: Peter doesn’t end up dying. Instead, he flies, and as he zips around, even though briefly, the anachronistic magic of our introduction to Wright’s Neverland dissipates. Pan isn’t as screwy and unconventional as its musical choices want us to think it is. In fact, it’s the very definition of “conventional,” a movie whose script is made up of bad Hollywood plot tropes rather than, you know, actual writing. Prequels; reboots; hero’s journey; destiny—Pan is the Batman Begins, or maybe the Star Wars prequels, among the current crop of recalibrated Disney classics. Except for when Wright injects a bit of the modern into J.M. Barrie’s antiquated fantasy, the film lacks a soul. It’s too busy trying to demystify the mystical things that make Peter Pan interesting in the first place. 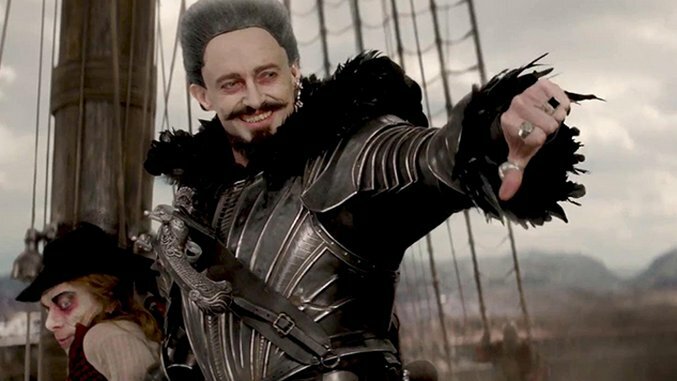 It’s not until we arrive in Neverland and meet Blackbeard (Hugh Jackman), the villain of the piece, that Pan figures out the kind of movie it wants to be, but it’s such an amnesiac production that it forgets almost as soon as the moment ends. Blackbeard is a big, nefarious presence, a flamboyantly wicked figure who promises his subjects confections and fun so long as they don’t cross his bad side, which is easier said than done. Blackbeard wants Pixum, Neverland’s natural but limited resource, a glowing ore that, crushed and inhaled, rejuvenates the flesh and theoretically provides immortality. Thankfully, the movie doesn’t go on for the eternity Blackbeard craves, but big ideas like this make movies like Pan feel incalculably small. They leech the wonder out of the material and leave it bone dry. Offering a synopsis of the film beyond its basic components feels fruitless. Pan tries to be inventive: Captain Hook is here refashioned as James Hook (Garret Hedlund, one of those bland hunks Hollywood futilely keeps trying to make happen), an adventurer who helps Peter bust out of Blackbeard’s mines and acts as his Han-Indiana-Rick-Solo-Jones-O’Connell. Tiger Lily, meanwhile, is swathed in shocking white brushstrokes and made into a stock woman warrior who looks like Rooney Mara. They’re both terrible, particularly Hedlund, who aims for Harrison Ford but somehow ends up reading a lot more like Stanley Spadowski. Frankly, the only person who appears to be trying here is Jackman, whose outsized performance dwarfs everything Wright throws at the audience, which is mostly comprised of ugly CGI. Pan is Wright’s Oz the Great and Powerful. This is what it looks like when a great filmmaker locks horns with a bad movie and can’t muster more than a few minutes of eye-popping vim to save themselves, much less the filmed endeavor. Who asked for this thing to be made? Did we need another big budget affirmation of presumed white male exceptionalism? Did we need Neverland filtered through the lens of James Cameron? Pan gathers so many disparate influences that a dozen audiences in a dozen different states might pick out an absolute smorgasbord of different reference points the film contains. This is barely an adaptation, much less a reimagining. It’s an embarrassing pastiche. Boston-based critic Andy Crump has been writing online about film since 2009, and has been scribbling for Paste Magazine since 2013. He also contributes to Screen Rant, Movie Mezzanine and Birth.Movies.Death. You can follow him on Twitter. He is composed of roughly 65% craft brews.